Why Is Salt So Bad for Your Elderly Loved One? Home Health Care Atoka TN – Why Is Salt So Bad for Your Elderly Loved One? Your loved one might not be so happy about hearing her doctor tell her that she needs to reduce her salt intake. In fact, she might rebel. If her doctor is recommending this change, however, it’s an important one to adopt as quickly as possible. The main problem with salt for someone who has heart problems is what it does in the body. Salt in smaller amounts is necessary, but as the salt increases, it causes your loved one’s body to hold onto more and more water. As your loved one’s body retains more water, there’s nowhere to put it all. Your loved one’s blood vessels and heart have to work harder in order to function at even close to the same level. Reducing salt intake reduces this stress on your loved one’s body. Almost everyone eats more salt than they realize, your loved one included. This is especially true if your loved one doesn’t keep track of her sodium intake. Because salt is a preservative as well as a flavoring agent, it’s used in almost all foods, even sweet baked goods. Prepackaged and processed foods are among the worst in terms of excess salt. The salt helps to preserve these foods longer and can help to make them more palatable, too. Soups are particularly high in salt, sometimes even if they’re labeled as low-sodium versions. It’s important to start reading labels for all of the packaged foods your loved one eats. 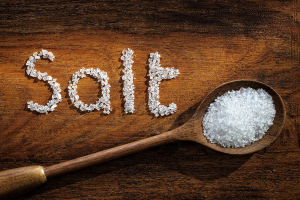 Some other foods contain what’s called “hidden salt.” This is sodium that you really don’t taste and that you don’t notice as much, but it’s still there and it still adds into your loved one’s salt intake for the day. Condiments typically contain quite a bit of salt, as do pickles and pickled foods. Cheese, bread, and even some milk products contain quite a bit of salt, too. Let other people who help you and your loved one, such as other family members and elderly home health care providers, know that you’re watching your loved one’s salt intake so that they can help. For Home Health Care Services in Atoka TN, please contact the caring staff at Personal Care Services MidSouth today! This entry was posted in Healthy Eating for Seniors, Home Health Care Atoka TN and tagged Home Health Care Atoka TN. Bookmark the permalink.